Einstein’s Bagels And Why They Apparently Think I’m An Illiterate Putz. I have a big superego. I freely admit that. I think a person should go out of their way to do the right thing and if something is wrong then you just don’t do it. That doesn’t make life in this culture very easy sometimes. A Neutral Good character is guided by his conscience and typically acts altruistically, without regard for or against Lawful precepts such as rules or tradition. A Neutral Good character has no problems with co-operating with lawful officials, but does not feel beholden to them. In the event that doing the right thing requires the bending or breaking of rules, they do not suffer the same inner conflict that a Lawful Good character would. When I see a rule being broken, and I think it is a good rule, a law being scoffed, and I think it is a good law, one that makes sense, one that deserves to be followed, I find myself wanting to do something, and that oversized superego means I have no problem doing it. And I’m a fixer. When I see things that aren’t right, I want to fix them. Need to fix them. Even if I’m hungry. I was up early. Too early, really. At five-fifteen. Why? Because I’m the only one who shows up to Wednesday six a.m. spin class and I don’t want Tammy to lose her income for that class. So I went, even though I hadn’t slept well and even though I had to be back at the gym an hour later to see a string of members for short, introductory sessions of assisted integrated stretching from eight am through six that evening. Spin class over, I ran home, showered and, after feeding Dusty, let her out. In the meantime I was going to make my own breakfast in my beautiful (and it is) healthy (and it is) lovely (and it sure is) Vitamix. Looking out the kitchen window I notice something. I notice that I don’t notice Dusty. She has leapt the fence again. So much for my salad smoothie. And so much for my coffee. I walk out the back door and she isn’t there. I walk out the front door and she isn’t there. Down the street to where she plays with Rank and she isn’t there. It is five to eight and I can’t do anything but hope she likes her new family, wherever that is. So much for breakfast. Sure, Dusty gets to eat and play, but I don’t. Off to the gym. Two hours and six patients later, I’m hungry. I have a break and my blood sugar is low enough that I know for sure I’m headed for a bad choice. Luckily, Einstein’s Bagels is a block away, on Babcock and Palm Bay Road. A salt bagel and coffee. Maybe even some lox. Without enough time to walk, I get into the truck and drive over. I park and have my Einstein’s cup, my cup about to be filled with free coffee, in my hand. Coffee. Bagel. Salty salty fish. But first, the bathroom. 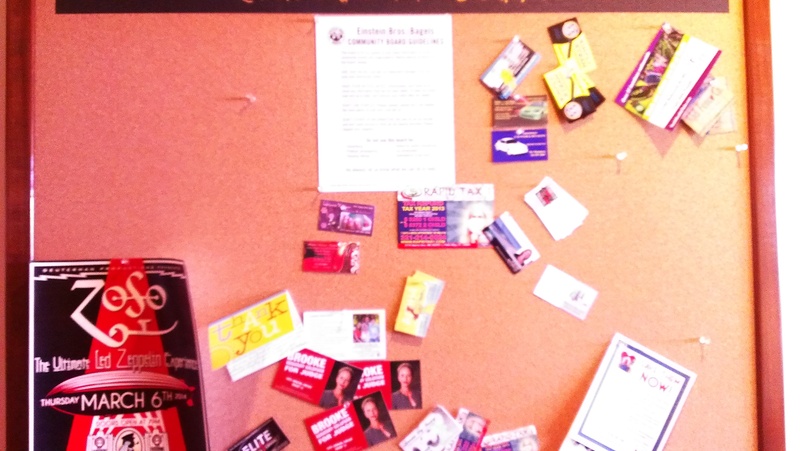 On my way in, I see the community board. The last time, there was barely anything on it. An announcement or two. And it was neat. Not now. The fact that I can barely hold it (and why didn’t I go at the gym? Oh, yes, I was hungry and my blood sugar was dropping) doesn’t keep me from staring at the board and noting that most of the things on it are not supposed to be there, according to the big old sign smack in the upper-middle of it all. OK. Bathroom. Then I can talk to the fellow at the register as I order my bagel and coffee. “Anything else?” I look at his name tag. He is the manager. Perfect. “I’m offended!” He says this as though I had said he mom hadn’t any pants on either. And I am quite well confused. I can’t imagine how I could have offended him. “Come with me, please.” I gave him a follow-me index finger and walked over to the board about four feet away, the order area being at the end of the long counter and just before the short hallway to the bathrooms, halfway down, on the right side off which is the community board. I point out the sign. I cocked my head to the side. The way a puppy does when he’s confused. I find myself doing that quite a bit. “Now I am offended” It is his turn to look confused. “You are telling me” (and I step very slightly closer to him) “that I am either illiterate or I am a putz!” I take care to pop my P like I’m trying to explode a microphone. I walk back to the counter. He follows. Each of us on our proper side. I walked out. To the car. I get my phone. I walk back in, camera on. “Really? People take pictures when they check in on Facebook. There are pictures on Yelp. On your own Facebook page, people upload pictures. And how are you going to stop me? 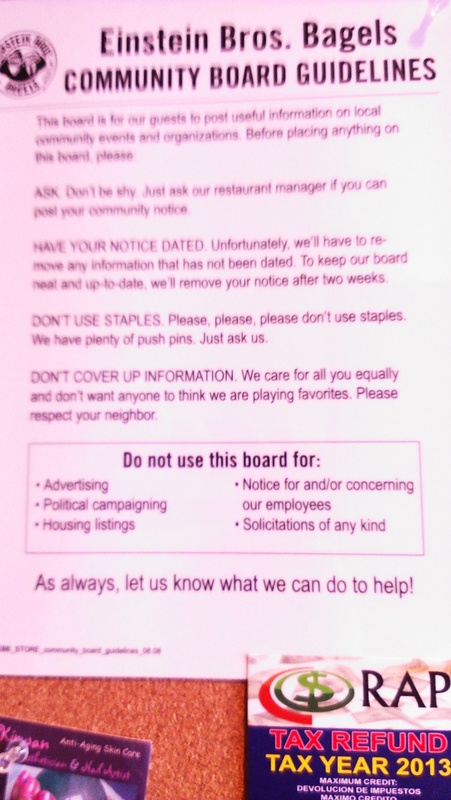 Afraid some other corporation is going to copy your community board?” I take one picture. “Besides, how else will I spread this great story all over social media without a picture?” I take a close-up of the sign. I smile and walk out. Back to the gym I go. I’m still hungry. But I know the bagels are no good for me anyway and now I certainly won’t be having any. Not today. Not tomorrow. Not soon, unless they are really really good ones. No matter. Right is right. But I sure could have used some coffee. Prompted by the movie Blackfish and the very heartfelt question of a young lady. And thank you, as always, to Craig Smith for the design. And thank you to Arlene Gorgone for the movie and G!G! for the inspiration. Words and photograph by me. Photo taken at Castaway Point in Palm Bay, Florida, along the Indian River. Please feel free to share, post, pass-along, borrow, steal, copy, paste and pilfer. Unexpected, curled up in words.